The giant radioactive lizard has appeared in 30 features over a span of 63 years. The latest in the series is titled Shin Godzilla. Most movie stars would seem a little tired after appearing in 30 features over a span of 63 years (not including his American-made outings) so you’ve got to give it up for Japan’s most famous giant radioactive lizard. The latest in the long-running kaiju movie series, Shin Godzilla has been widely praised as return to form for the big green one. Indeed, it was the highest-grossing live-action Japanese feature in Japan last year and the winner of seven prizes at the country’s national film awards, including Best Picture. 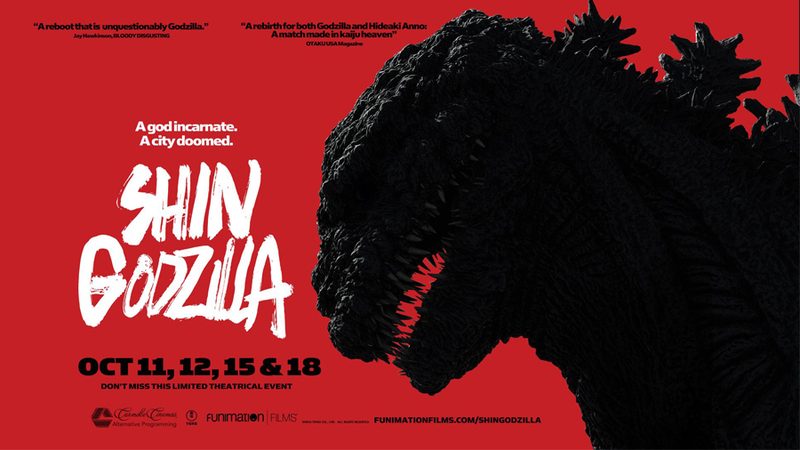 A surprisingly savvy combination of traditional kaiju mayhem and the sort of social satire more commonly found in Korean blockbusters, Shin Godzilla plays the Toronto Japanese Film Festival on June 18. The TJFF has become a reliably generous and diverse showcase of recent faves among critics and audiences in Asia that may have had little circulation in the rest of the world. One such example is Satoshi: A Move for Tomorrow, a suitably dignified biopic about a revered master of the Japanese game of shogi that plays its Canadian premiere on June 11. A North American premiere for the TJFF on June 15, Honnouji Hotel is a hit comedy about a modern young woman who gets into trouble with samurai warriors after accidentally tumbling into a time portal to the 16th century. A movie that makes a more straightforward but still compelling embrace of period action tropes, Mumon: The Land of Stealth pits samurais against ninjas and we couldn’t be happier. The TJFF hosts the movie’s North American premiere on June 28. Mumon director Yoshihiro Nakamura is one of the fest’s many filmmaker guests. On June 12, the TJFF is understandably proud to present a performance by Toronto taiko-drumming group Nagata Shachu along with a screening of The Ondekoza, a recently rediscovered 1981 documentary about one of Japan’s founding taiko ensembles. The TJFF runs to June 28 at the Japanese Canadian Cultural Centre (6 Garamond Ct.). Funeral Parade of Roses: In what’s certainly the cultiest of cult-movie screenings this week, VICE and the Royal co-present a new 4K restoration of one of the weirdest movies of the Japanese New Wave. Initially released in 1969, Funeral Parade of Roses is an assaultive drama by director Toshio Matsumoto that delves deep into Tokyo’s underbelly. With its often disturbing images of youth run amok and its high-velocity, high-impact editing, Matsumoto’s film had a direct influence on the look that Stanley Kubrick devised for A Clockwork Orange. You too can join the parade at the Royal on June 9. Italian Contemporary Film Festival: Founded in 2012, the ICFF has rapidly grown into the largest Italian film festival outside of Italy, with simultaneous editions in six Canadian cities this week. TIFF Bell Lightbox and Cineplex Cinemas Vaughan both host showcases of new Italian features, doc and shorts to June 16 — highlights from the slate include the romantic drama 7 Days, the culinary-themed romance The Space Between and a special focus on Italian-Canadian films like Paul Tana’s very fine 1992 period drama La Sarrasine. Canadian Sport Film Festival: Founded in 2008 to celebrate sport’s power as an agent for social change, the Canadian Sport Film Festival returns this weekend for a program of screenings and events at TIFF Bell Lightbox. It begins June 9 with the Toronto premiere ofKeepers of the Game, a documentary about an Indigenous girls’ lacrosse squad in Fort Covington, N.Y. Other new docs at the CSFF include Hillsborough, a look at the British soccer tragedy that killed 96 people in 1989, and Crossing the Line, a profile of Danny Harris, an American hurdler who battled depression and drug addiction after winning a silver medal at the 1984 Olympics. The Canadian Sport Film Festival runs June 9-11. Scarborough International Film Festival: The fifth annual SIFF continues its run in various east-end venues, including Scarborough Bluffers’ Park. That serves as an appropriately scenic venue for a free screening of 2001: A Space Odyssey on June 10. The festival also presents a 25th anniversary showing of Wayne’s World (starring Scarborough’s pride and joy Mike Myers) on June 9 at Albert Campbell Square. Meanwhile, the cinephile-friendly slate at the Fox includes the Chilean drama The Blind Christ and Loving Pia, a Danish doc that recently debuted at the Berlin festival. The SIFF runs to June 11.